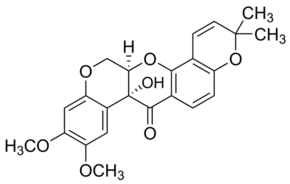 Relevance Tephrosin is a plant-based rotenoid which has known anti-cancer properties. Tephrosin inhibited proliferation in A549 cancer cells in a dose-dependent manner. Tephrosin has been shown to induce caspase-independent apoptosis, and internalisation and degradation of inactivated EGFR and ErB2 in human colon cancer cells.